Calming Complexion Serum is a soothing nighttime serum for all skin types. 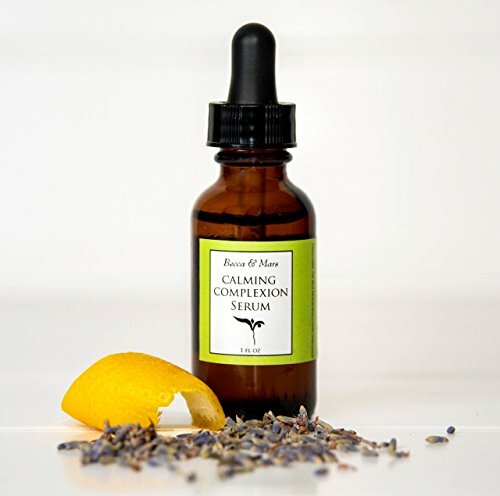 This combination of plant, seed, nut and essential oils heals and moisturizes your skin. It's gentle, not too oily, and perfect for skin that just needs a little extra care. Ingredients include: *Hazelnut oil - sightly astringent and nourishing to the skin *Borage Seed Oil - soothing for damaged skin, full of essential fatty acids (GLA) to restore moisture *Jojoba Oil - anti-inflammatory and anti-bacterial; incredibly similar to our skin's natural oils; easily absorbed without leaving a shiny or greasy residue *Pure essential oils of Lemon and Lavender to help fight irritation and reduce inflammation * Vitamin E - an antioxidant and preservative that can help to heal and protect skin from damage. *Vegetable Glycerin - Good for dryness and overall sensitive skin. No artificial color, fragrance or preservatives are used in this product. To use: In the evening, smooth over face, neck and chest area. Pat gently around eye area. Oil comes in 1oz amber glass bottle with dropper. Store in a cool, dark place. Do not ingest. Many essential oils are not recommended for use during pregnancy. Do not use if you have nut allergies. Citrus essential oils are photosensitive. Avoid sunlight after applying to skin. If you have any questions about this product by Becca & Mars, contact us by completing and submitting the form below. If you are looking for a specif part number, please include it with your message.